Should we rename the Wells Fargo Center after a prominent Philadelphian? 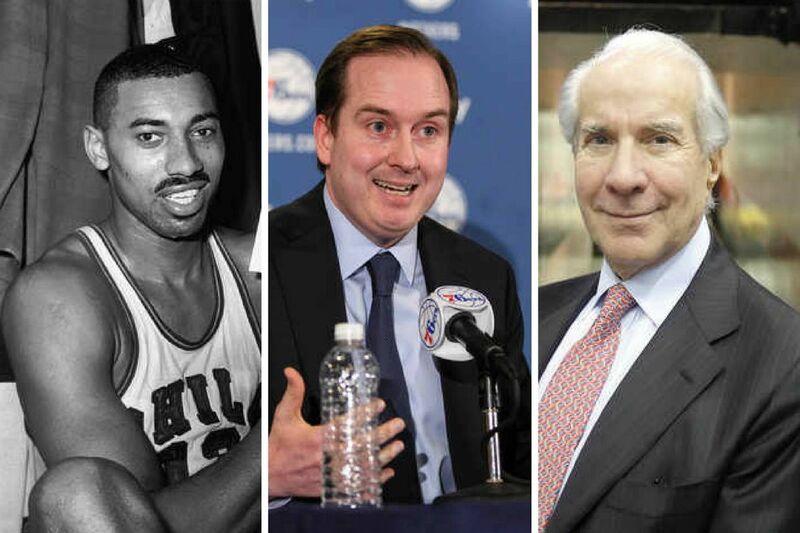 Readers suggest (from left) Wilt Chamberlain, Sam Hinkie and Ed Snider. When the Flyers finally hoist another Stanley Cup, can they do it on the familiar home ice of the Ed Snider Arena? Will Ben Simmons and Joel Embiid someday be doing their thing on the hardwood at the Hinkie Center (a.k.a. "The Process Center" — just trust us). Would civic leaders ever poke the stick of controversy with the Frank Rizzo Center, since, after all, there's a giant statue that's desperately looking for a new home? Either Wilt Chamberlain or Hank Gathers. — Mak Trolio Sr.
Feel free to continue the conversation below or join the conversation on Facebook. As I'm sure Ed Rendell would tell you, there are plenty of interesting names that haven't come up yet. Columnist Will Bunch has an idea. He wants the people of Philadelphia to rename the Wells Fargo Center, home of the Philadelphia 76ers and Philadelphia Flyers, after a real hero.What should it be called?